A Facebook user recently shared a photograph of a young boy who had run over a chicken. The real story will melt your heart. Bengaluru: While the world debates over becoming vegan or meat-heavy protein diets, there are some people whose love for animals is not just defined by food. A Facebook user recently shared a now-viral post about a young boy who seemed to have accidentally injured a chicken. 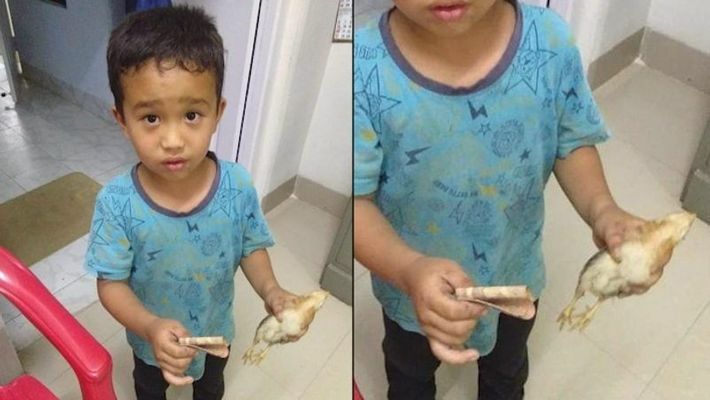 According to the post, the little boy in the photograph is from Mizoram and he had accidentally run over his neighbour's chicken. Instead of people who abandon even humans after hitting them with their vehicles, this little boy felt so bad with his accident that he rushed the chicken to a nearby hospital with whatever little money he had. The story will surely restore your faith in humanity. The picture shared by a Facebook user went viral with more than 64,000 shares and 7.700 comments. In the picture, the little boy is looking so cute and literally will melt your heart.